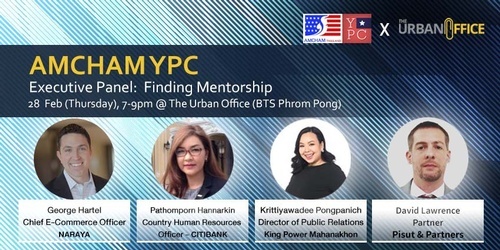 On 28 February (Thursday), AMCHAM Young Professionals welcome you back to a short panel about using mentors to develop your network and career. It always helps to have good advice, and here is a great chance to find it. Meet a mix of foreign and local executives who are joining us to share insider career tips and stories on how they climbed the corporate ranks. Guest are invited to bring questions for the panelists, and business cards to introduce yourself afterwards. K. Petch at 02 254 1041 ext 223. Please register in advance on the AMCHAM website or Facebook page. All proceeds benefit the American Chamber of Commerce in Thailand Foundation (ATF) - Adopt-a-School program.